Three OSD teams from Olympia and Avanti high schools excelled at the FTC South Washington Championships and earned the right to compete in the FTC State Championships in Issaquah in January. 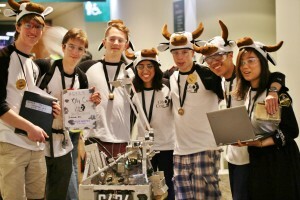 At “State”, one OSD team, Oly Cow (FTC Team# 6424), from Olympia High School advanced to earn a berth at the FTC Western U.S. Super-Regional, held in March in Sacramento, CA. 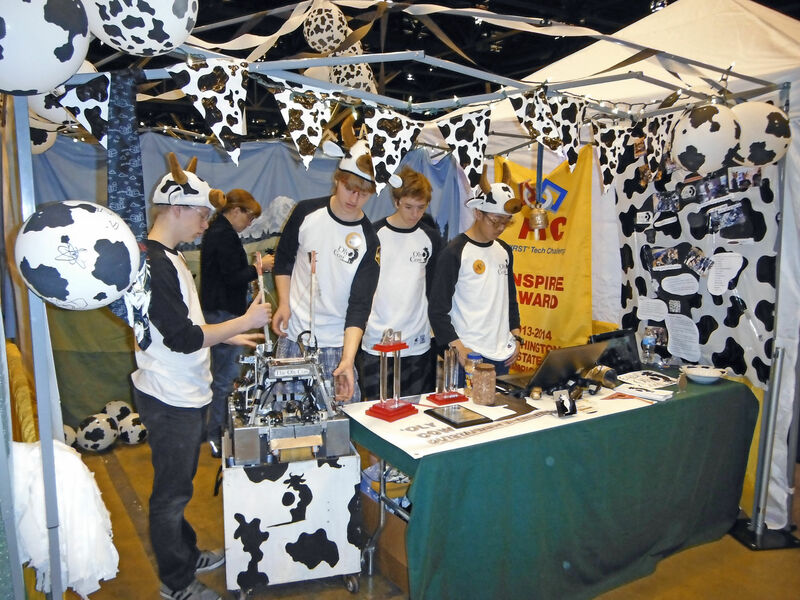 At the Super-Regional, Oly Cow members were awarded Divisional Finalist medals, which in turn qualified them for the FTC World Championships in St. Louis. Oly Cow is a veteran team that formed as a club in 2012, since OHS did not yet have an advanced Robotics Engineering class. This team met exclusively after school and on non-school days to work on their robot. The team worked off-season, engineering a unique drive system and participating in community outreach events. Oly Cow qualified for the State Championships based upon their winning the Think Award (for engineering design) at the South WA Championships. 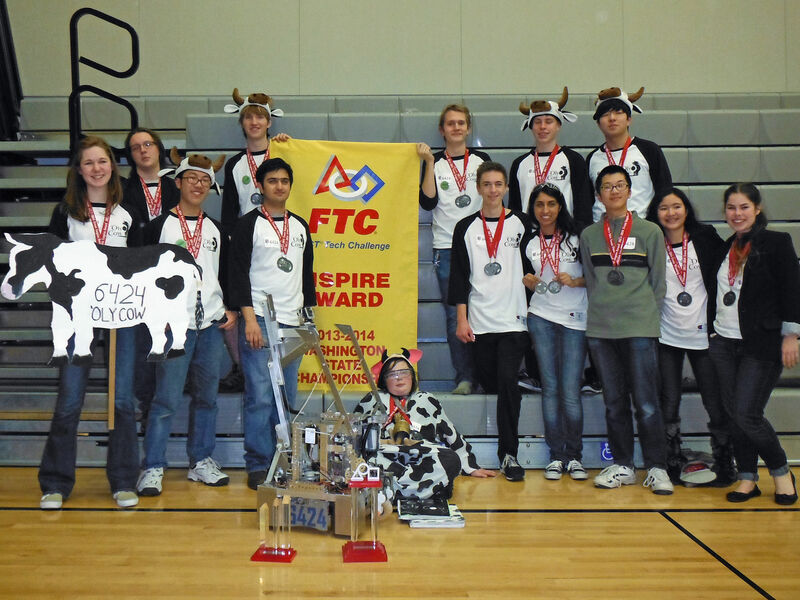 The team subsequently won the Inspire Award, FTC’s highest honor, at the Washington State FTC Championship. 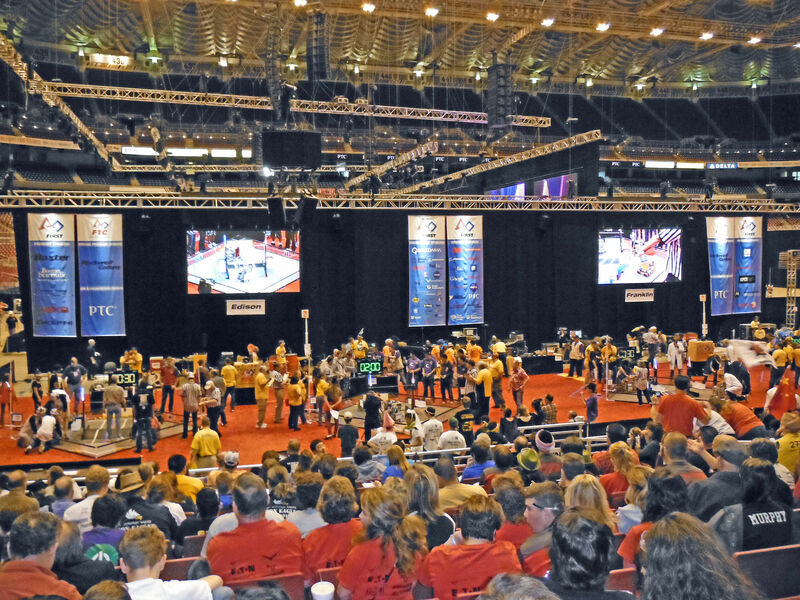 The FTC World Championships were held in the Edward Jones Dome (the St. Louis Rams’ domed football stadium) on April 23-26. 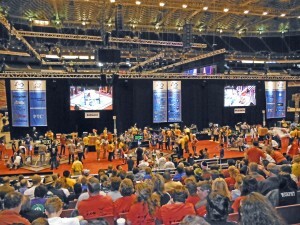 Only the top 4% of the 3,300+ FTC teams from around the globe earned a berth at this “Block Party” culminating event. The 128 teams were randomly organized into two divisions, with Team# 6424, Oly Cow, assigned to the Edison Division. The team left school around noon on Tuesday April 22 and arrived at their St. Louis hotel around 1:00 am on the first day of the World Championships. 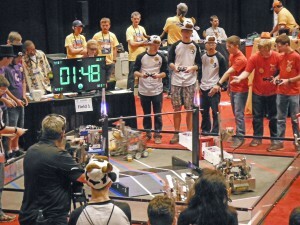 On the first day, Wednesday, April 23, teams unpacked their robots, set up “the Pits”, and prepared their robots to pass the various required inspections. The stress of this process was elevated by having trusted their robot the day before to TSA inspectors and four sets of airline baggage handlers. 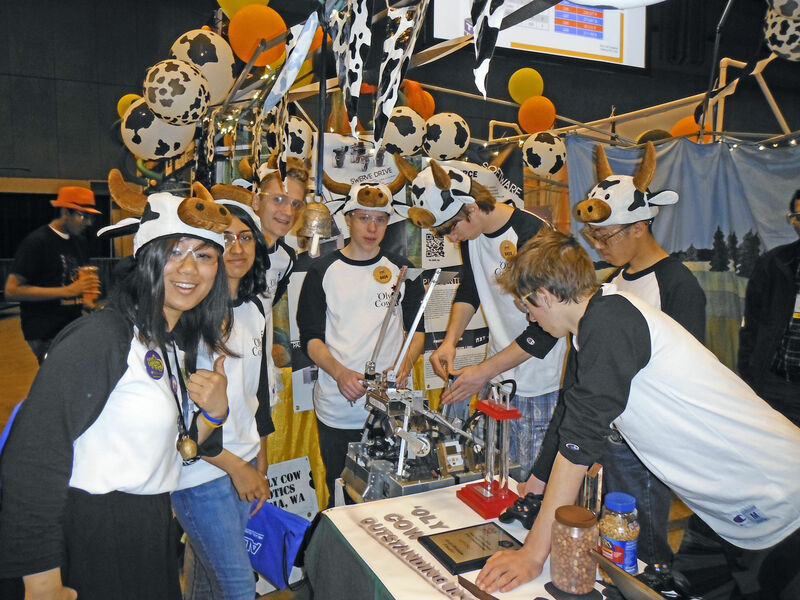 Fortunately, with minor tweaks, the Oly Cow passed inspection and the team tested their robot functionality as they took turns on the practice fields. 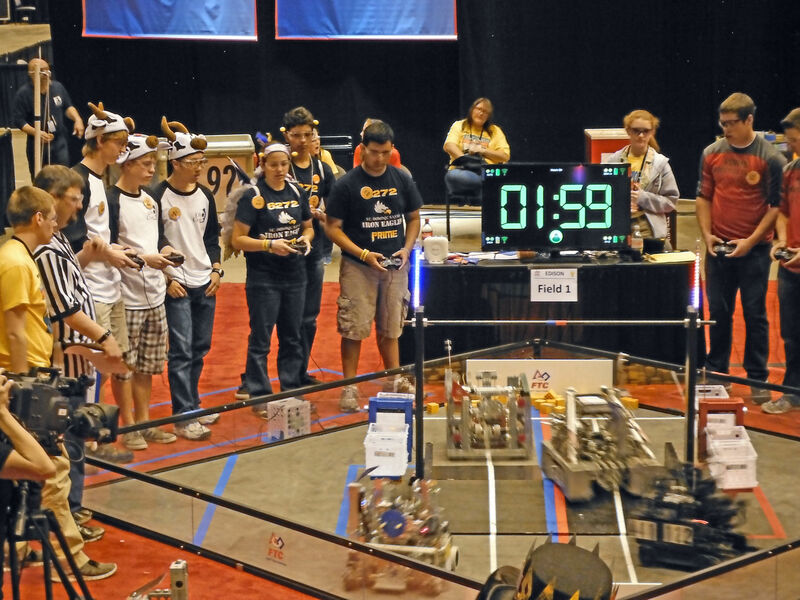 They also began scouting the other 63 teams assigned to their division, both as potential partners and adversaries, since teams are randomly assigned to alliances. The second day, Thursday, consisted of six rounds of qualifying matches. Oly Cow’s competition got off to a strong start, taking their first three matches, entering the early afternoon matches in 8th place. After paring with a weak team (win-less in their first 6 matches), Team# 6424 lost their 4th match and dropped to 10th place. Undeterred, Oly Cow fought back, winning their next two matches to end the first day with a 5-1 record. At this point, there were no undefeated teams, and Oly Cow was one of 10 teams with a five-win record. Due to the tiebreaker rules, this placed the team in 8th place out of 64 after the first day of competition. Friday got off to a rough start, when the team lost their first match of the day in a very high scoring contest. This dropped the team to 10th place, before the rebounded with their highest scoring matching of tournament, nearly emptying the field of the 100 available scoring cubes. This performance elevated the team back to 8th place and drew a lot of attention from teams scouting for elimination round alliance partners. Oly Cow played their ninth and final qualifying match with against the #1 seed and lost a strategic battle, but again showed their ability to score many points, even with a weak partner. This final loss gave the team a 6-3 record and a 16th place finish in their 64 team division. While this ranked them in the top quartile of teams, only 12 teams would advance to Saturday’s elimination round. 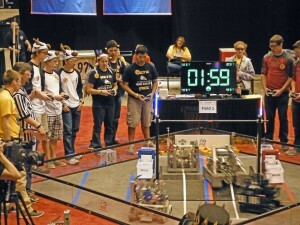 The four top ranked teams become alliance captains, and then choice two teams each as their elimination round alliance partners. 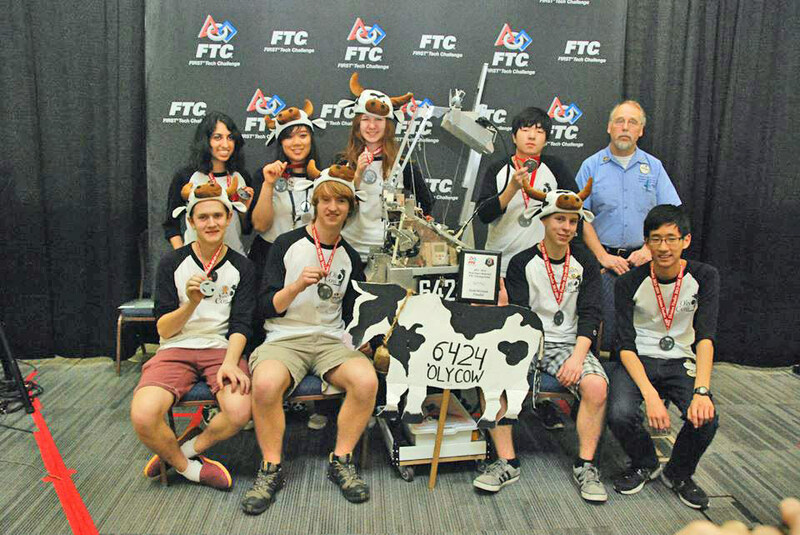 Despite being ranked 16th, Oly Cow’s dominant performance on the field drew the attention of teams, and Team# 6424 became the first round pick of the #3 alliance; picking them before nine other higher ranked teams. 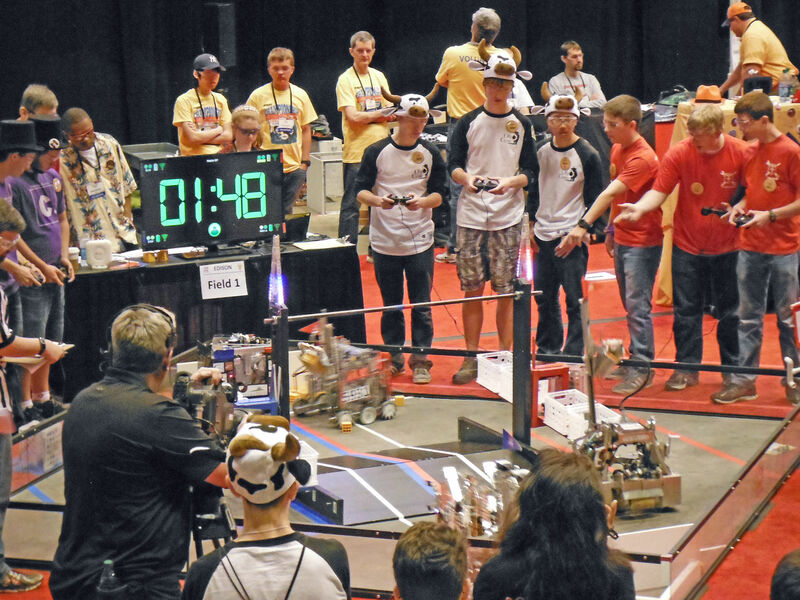 Saturday began with the divisional semifinal round, and the Oly Cow alliance lost the first match in the best-two-out-of-three round when their alliance captain’s robot became disabled part way through the match. Oly Cow did not play in that first match (only two of each alliance’s three teams play in a match), however they played in the second match, winning to tie the series 1-1. Oly Cow was again chosen to play in the tiebreaker, and the team pulled off another win, taking the semifinals series 2-1 over the #2 seeded alliance. 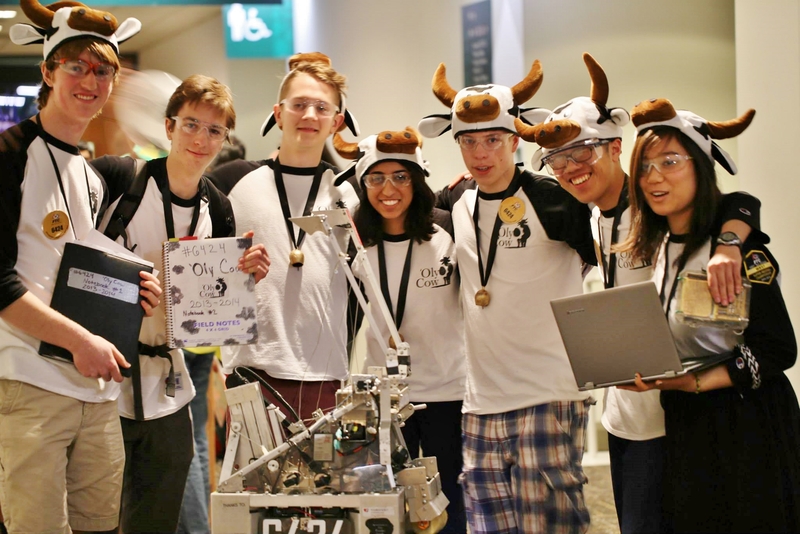 Unfortunately, during the divisional finals, the Oly Cow alliance lost two straight matches to the #1 seeded alliance, ending their amazing run just one rung short of playing in the FTC World Championship round. During the Awards Ceremony, the team was named as a finalist for the Motivate Award, in recognition of their tremendous support of the other FIRST teams in the Olympia League. 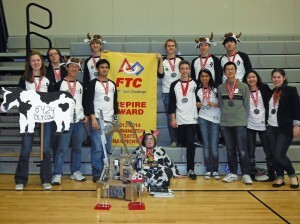 Oly Cow’s third place finish was recognized by being awarded Division Finalist medals to the team members. This is the FTC equivalent of the “Final Four”, expect this cover the entire world, not just the NCAA. 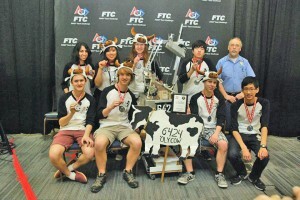 Congratulations to all the members of Oly Cow on their literally world-class performance during the FTC season. The team intends to continue working year-round on team development, robot building/programming skills, and to find sponsors and supporters to help create a sustainable business model. 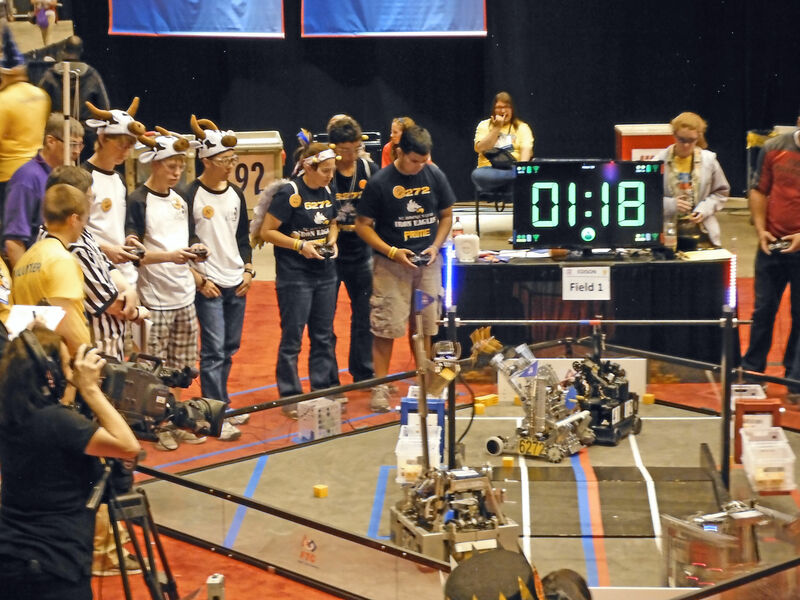 If you, or someone you know, is interested in supporting OSD’s FTC teams, please go to this STEM Pals Funding Needs page. Thank you!